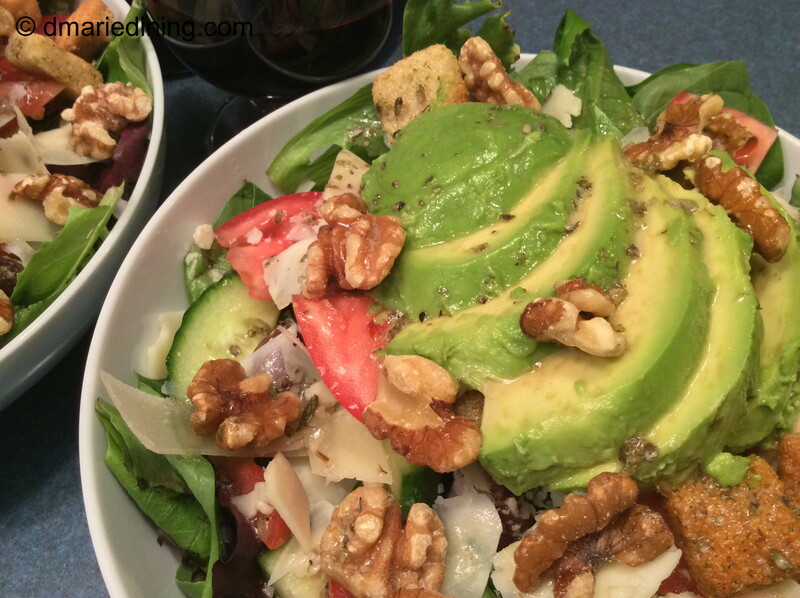 Today’s post is dedicated to Salads. 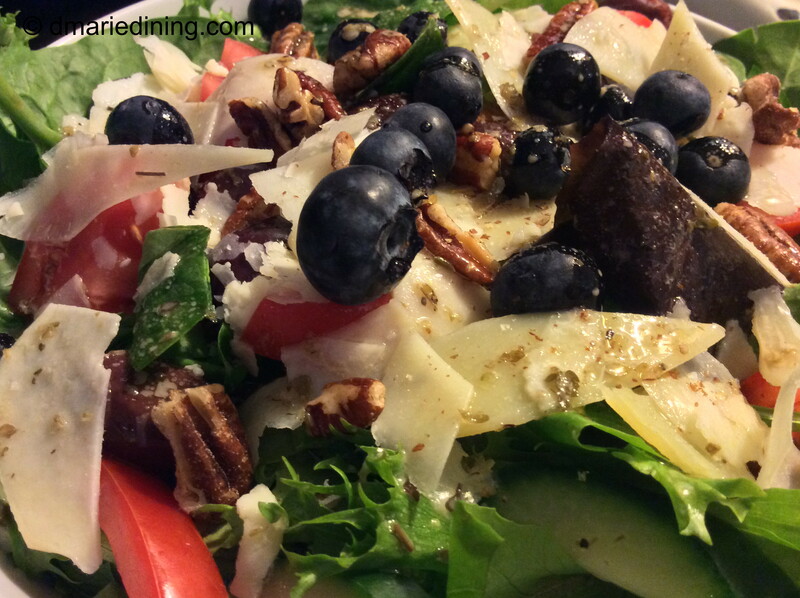 Salads are on our dinner table almost every night mostly because they are Healthy, Quick and Easy. Basic lettuce and tomato salads are a little too plain to make it on our table. I prefer adding various ingredients that touch on the five food groups which are vegetables, dairy, grains, fruit and protein. I have to admit in my early days of cooking I made a lot of plain salads. I thought I was spicing it up if I added avocado or seasoned croutons. I didn’t start experimenting with making more robust salads until I expanded my dining choices from food chain restaurants (no offense) to downtown restaurants with new age names (again, no offense) like “Planet One Bistro” which featured out of this world meals. Cute right? Okay, I made the name up because I didn’t want my local restaurants to be mad at me for saying their name was “new age”. Building a salad is like creating a work of art. Various colors, textures, shapes and sizes blend together into a beautiful edible piece of art both pleasing to the eyes and mouth. 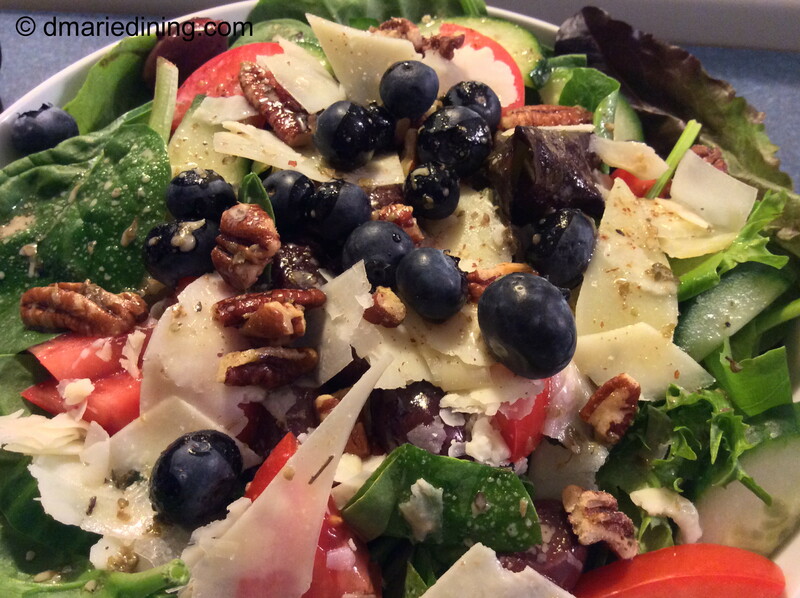 One of my signature salads is one made with a 50/50 mix of greens, bright red tomatoes, English cucumbers, deep blue blueberries, shaved parmesan cheese, croutons and crumbed bacon. I top it off with my favorite dressing Gazebo Room Greek Salad Dressing and Marinade. Yummy! My Big Salad is also a family favorite. If you ask me, it is hard to make a bad salad. 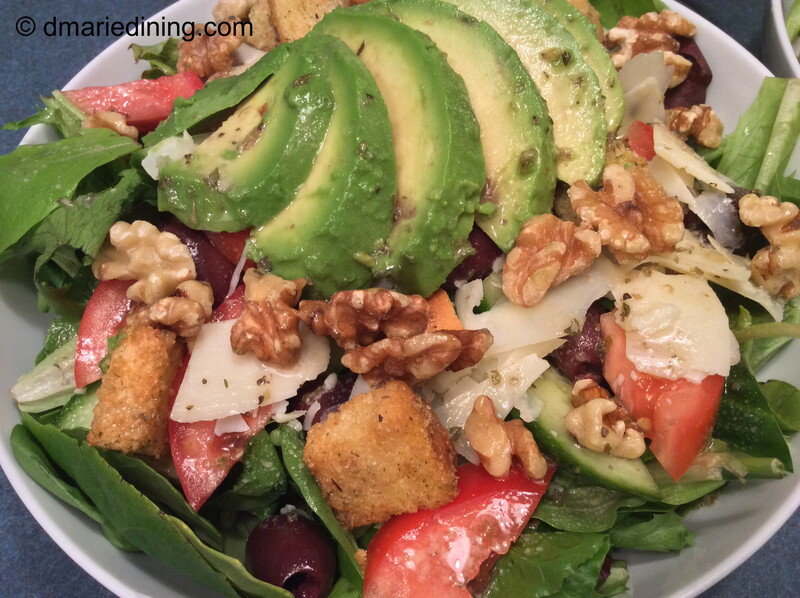 No matter what you add to a salad it is a reflection of you and your taste in food. So, go crazy and create your own master piece salad. It’s sure to get rave reviews. Layer the ingredients for each salad into two bowls. Top with Gazebo Room Greek Salad Dressing and Marinade or your favorite salad dressing. Since my #1 food tester is in college now (yes, hubby is my #2 taste tester) I sometimes have to rely on myself to eat leftovers. Even though I don’t mind eating leftovers for lunch or sometimes breakfast, there are times I have to make them more exciting in order to eat them. That is why I came up with Chicken and Gnocchi Stew. 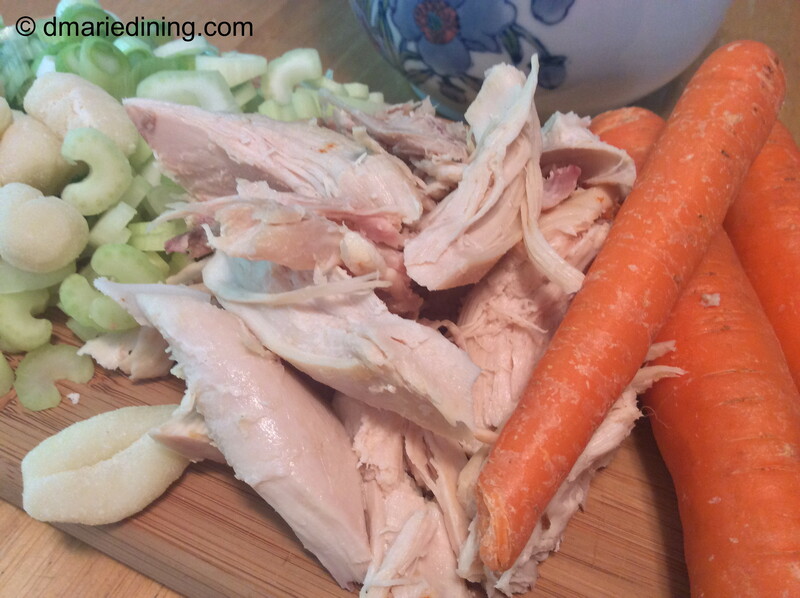 I had a leftover roasted chicken that needed a little tender love and care so it was perfect for a new recipe. Using an already roasted chicken meant my prep time was cut in half which made pulling the rest of the recipe together easy. 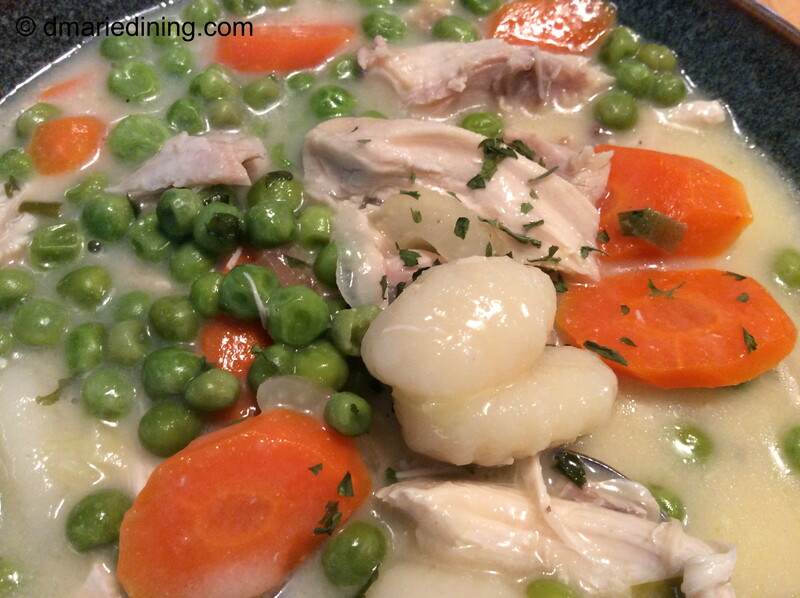 Chicken and Gnocchi Stew is mostly a different take on chicken and dumplings. Instead of nice big fat dumplings, there a little plump pillows of potato gnocchi. Gnocchi are right up my alley because I love potatoes. Adding gnocchi also eliminated the need to include potatoes in the stew. It was like a two for one deal! 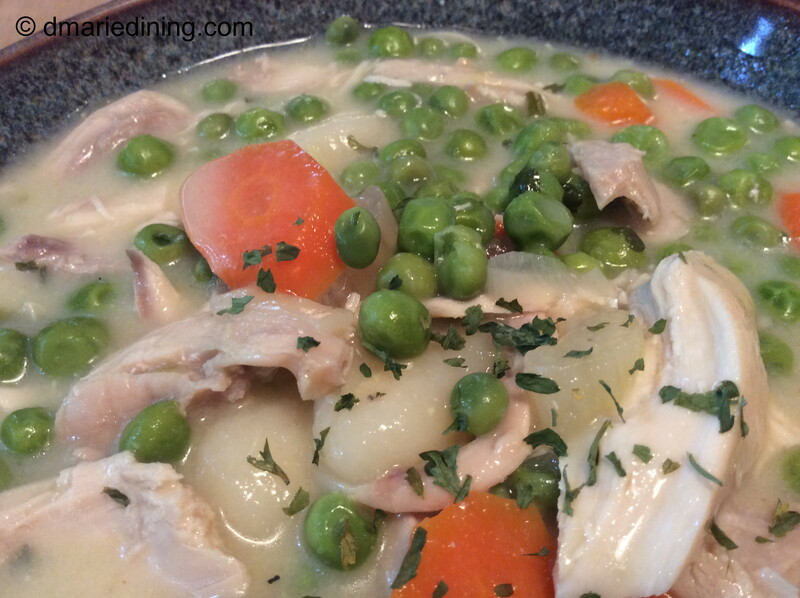 I put Chicken and Gnocchi Stew in the comfort food category. It is packed with vegetables and protein along a little of the other stuff we shouldn’t eat too often. Fortunately, the best ingredient in comfort foods like this one is love. Corny but true. Prepare gnocchi per package instructions. Drain and set aside. If using chicken breasts and chicken thighs, cook in 4 cups water with 1 tbsp salt for 25 – 30 minutes. Remove chicken from pot and let cool then remove skin and bones. Cut into bite-size pieces. 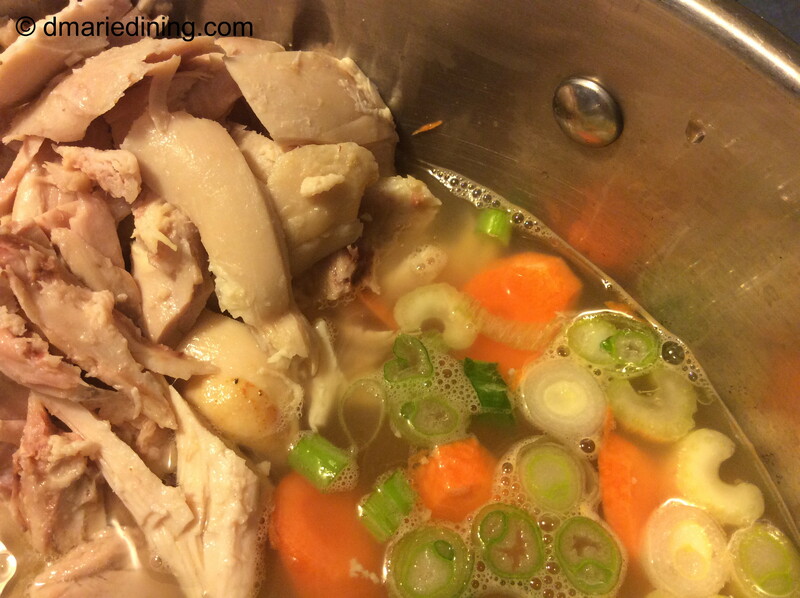 Pour chicken stock into a large pot. Add carrots, celery, peas and onions along with remaining salt, pepper and parsley. Cook over medium heat for 15 minutes. Whisk in cream of chicken soup. 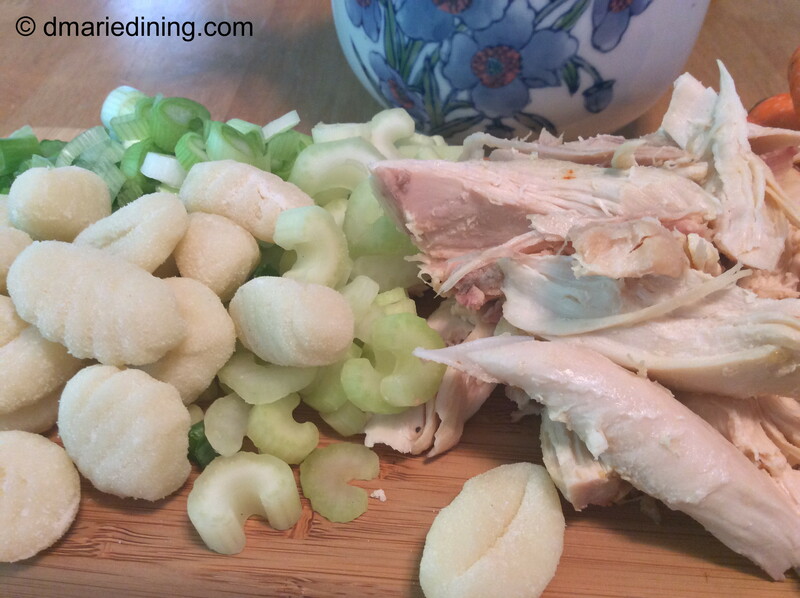 Add chicken and gnocchi cook for 15 minutes more. Serve with or over biscuits. Tastes even better the second day. The other day I was watching an old episode of the Barefoot Contessa about a seafood salad she was making for a friend and it included mussels. That got me to thinking about an old mussel recipe I had but never really tweaked. 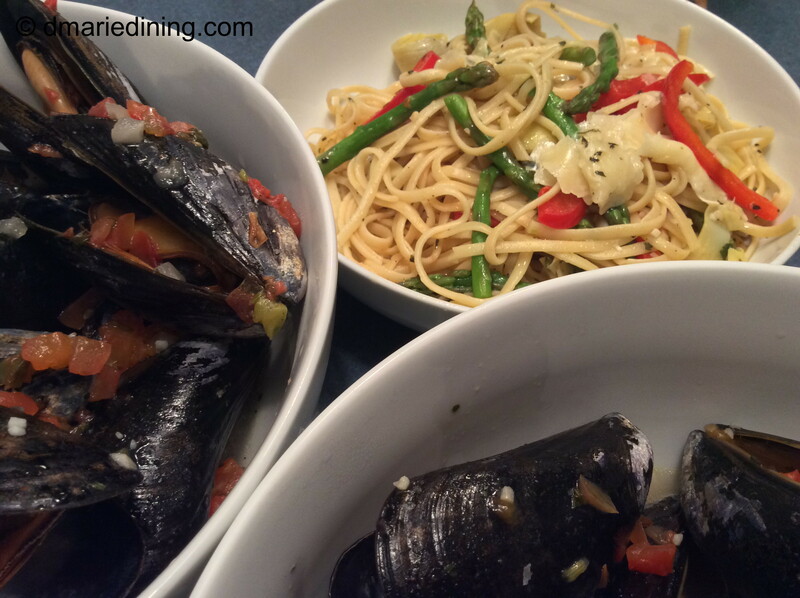 Since I needed a new post idea I decided I would work on creating a Kicked Up Mussels recipe. 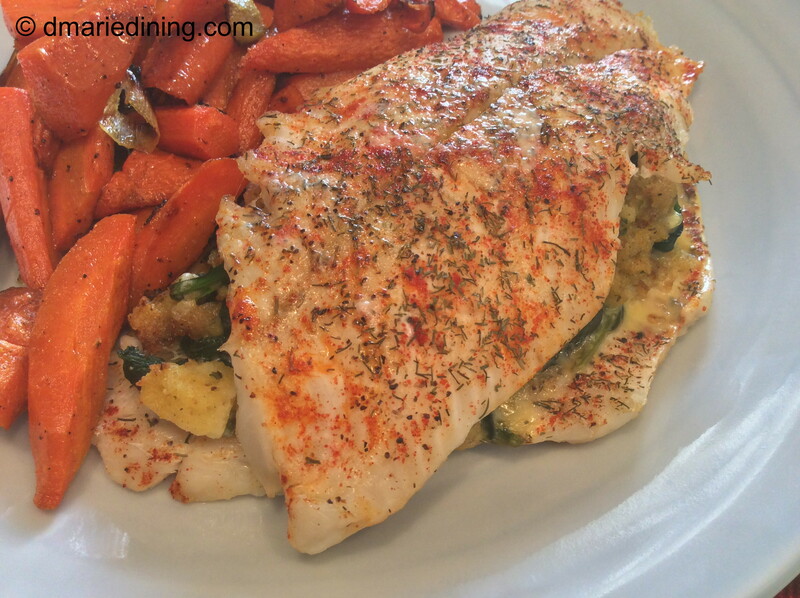 Both my hubby and I love seafood and besides eating a lot of chicken we eat a lot of fish. Once in a while I will throw together a shrimp or scallop meal if I have the ingredients. That is one of the issues I have in creating new meals during the week. It is too easy to keep using over and over again the same ol’ staples I keep in the pantry. Preparing a special meal takes planning and sometimes calls for an extra trip to the grocery store. Because I work full-time I don’t always have a lot of time to be creative with dinner. However, I have been known to have a burst of creativity now and again if I have not had a tough day at work. The weekends are really the best time for me to test out recipes and take my time to fashion a new recipe or try an old recipe with a new twist. Okay, back to the Kicked Up Mussels. I had to search a couple of my old recipe journals to find my mussel recipe and was happy to discover it was a pretty simple one. My original recipe called for beer instead of white wine like most other recipes. I could not remember if this was a good idea or bad idea. But hey, I use beer in a few of my recipes and I have not heard any complaints yet so I guessed it was a good idea. Since I was using beer instead of wine I had to find a nice light beer with a hint of citrus flavors rather than a dark beer which I thought would be heavy. I am not a beer drinker so my apologies to true beer drinkers if I don’t know what I am talking about. I did a little research by perusing the beer isle at a local liquor store with a large variety of beers. I landed on Namaste White which is by Dogfish Head Brewery located in Delaware. As a non-beer drinker I must say I enjoyed taking a swig of Namaste White after adding most of it to the mussels. The combination of orange, lemongrass and coriander in the beer along with the brininess of the mussels and aromatic herbs was genius. All right. I may not be a genius but the combination of flavors was genius. I will even go as far as to say my recipe would be welcomed in any 4 star restaurant. The proof is in the pudding. You be the judge and try it out. 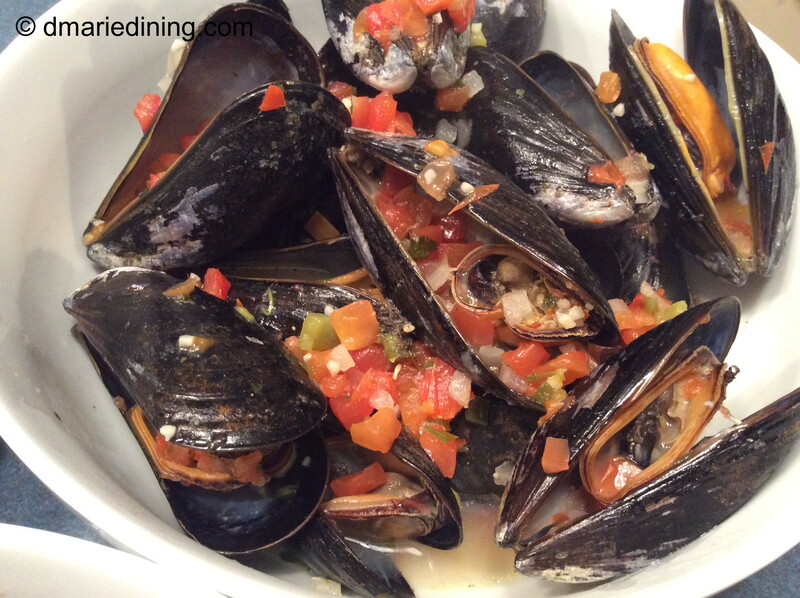 Clean mussels by running them under cold water and gently scrub them if necessary to remove dirt from the shells. Use a knife to remove the fuzzy beard if present. 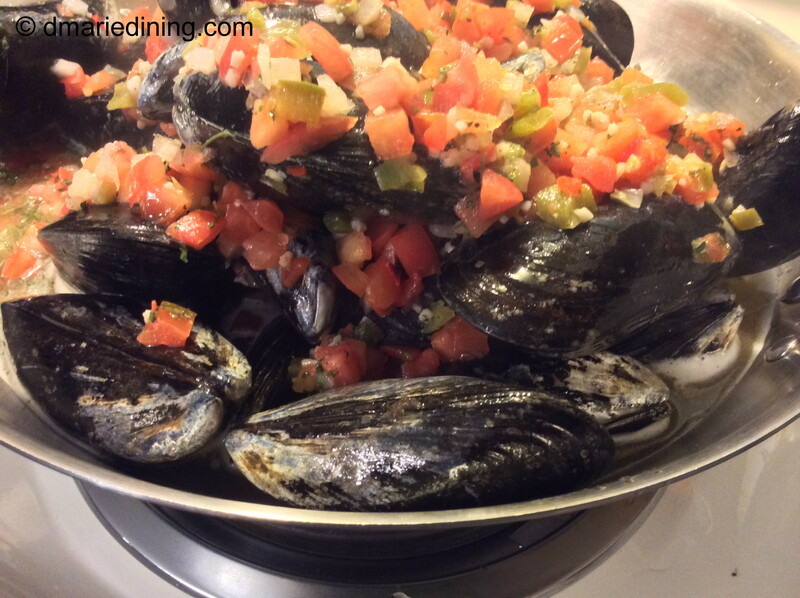 Arrange mussels in a large skillet. Set aside while sauteing tomatoes. Place olive oil in a medium sized non-stick skillet over medium high heat. Add garlic shallots, jalapeno pepper and tomatoes. Season with salt, black pepper and thyme. Stir then saute for 2 minutes. Move mussels to heat and pour tomato mixture and beer over mussels. 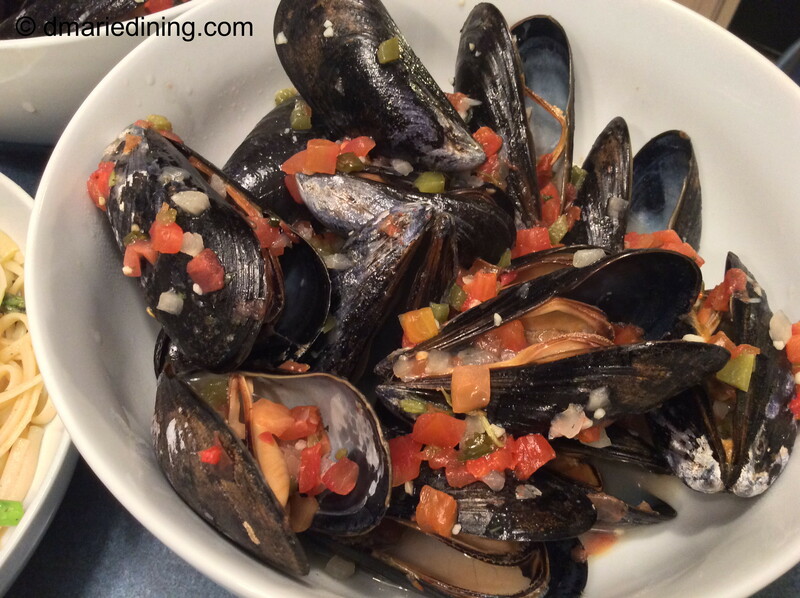 Sprinkle with red pepper flakes and shake to mix tomatoes and mussels. Cover and cook for 3 minutes until mussels pop open. Discard any mussels that do not open. Sprinkle with parsley before serving. Serve with crusty bread to sop up the delicious sauce. 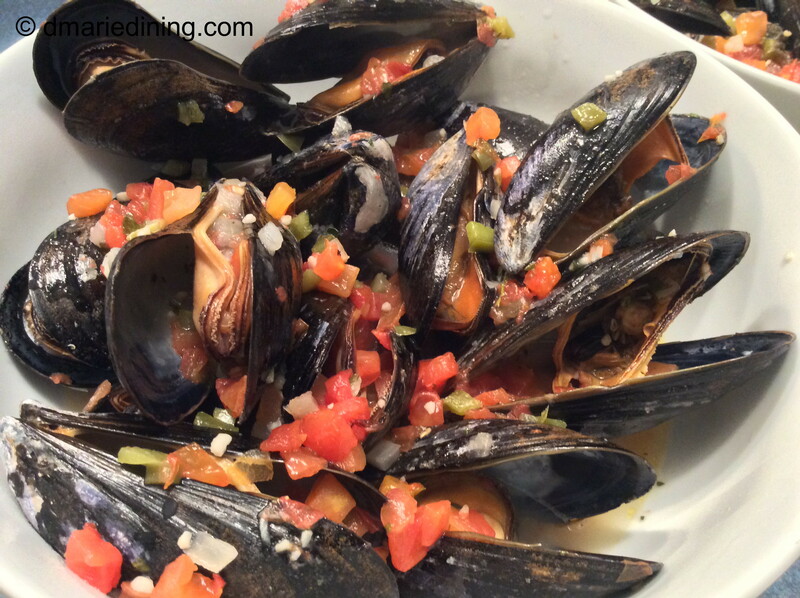 Tip: Cultivated mussels vs. wild mussels. If you purchase wild mussels, they may be a little gritty which means your mussels will be crunchy. To make sure you remove any sand from the mussels dissolve about 1/4 cups of salt and 2 cups of warm in a large pot along with 2 tbsp of flour or cornmeal. Add the mussels then cover with water. Soak for 1 – 2 hours. Drain then rinse the mussels with cold water. Most mussels you find in the grocery store are cultivated and do not contain a lot of sand or grit so there may not be a need to soak the mussels. Just clean the shells. To be on the safe side I would soak the mussels as I described. Fish Sale! I was at the grocery store looking for something to prepare for dinner and passed by the seafood counter when something caught my eye. Low and behold, they were having a fish sale. One of my favorite types of fish (Cod) was $3.00 less than usual. 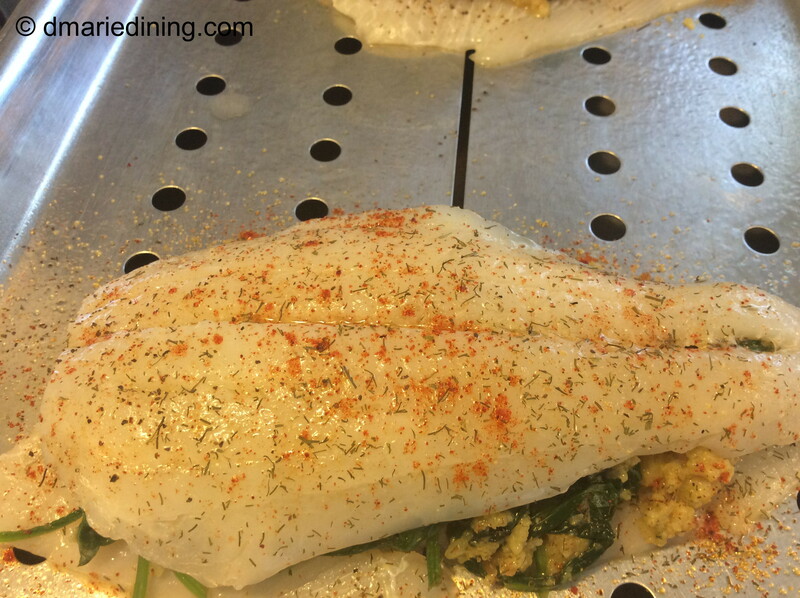 They also had another one of my favorites on sale – flounder. The flounder looked nice and fresh so I bought four fillets to make Stuffed Flounder for dinner. The reason I decided to make Stuffed Flounder was so I could use the rest of the cornbread stuffing we had the night before. Now, that our youngest son is in college I actually have leftovers. I don’t like wasting food so I try to find different ways to “re-purpose” the leftovers. 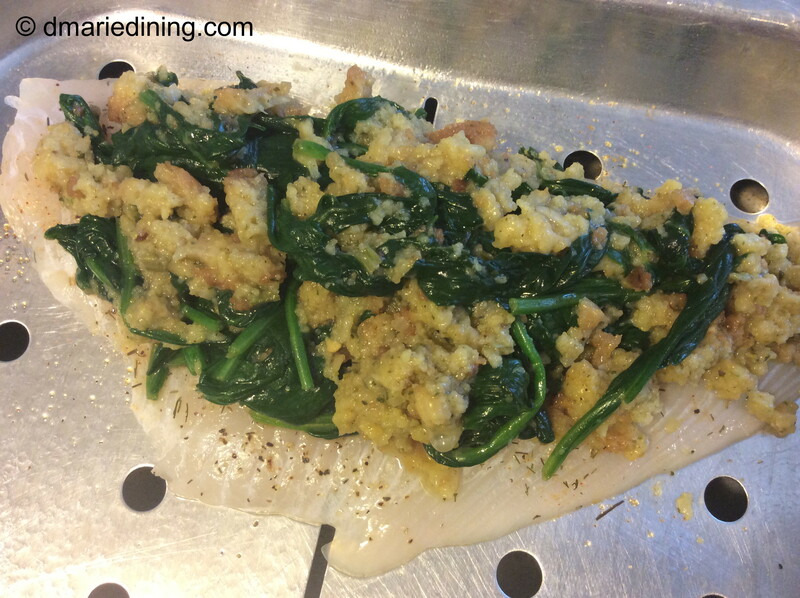 Making a spinach and cornbread stuffing for the flounder seemed like a great idea. Guess what? It was a great idea and hubby was happy with a full belly after he cleaned his plate. 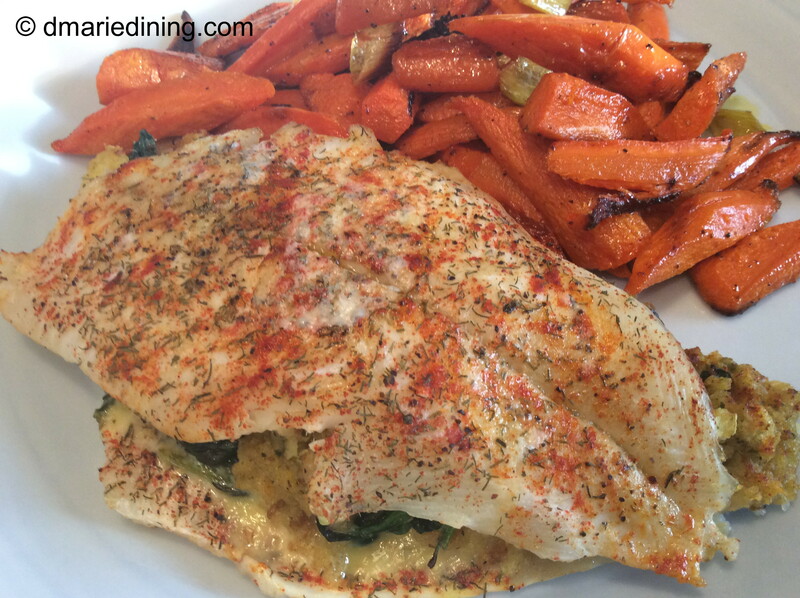 This was definitely one of my Health, Quick and Easy meals. The flounder was light and healthy. The stuffing was quick to make and putting the two together was easy. What could be better than that!?! Melt 1 tbsp butter in a medium sized skillet over medium heat. Add spinach and water. Sprinkle with salt and black pepper to taste. Cook until spinach is wilted stirring occasionally. 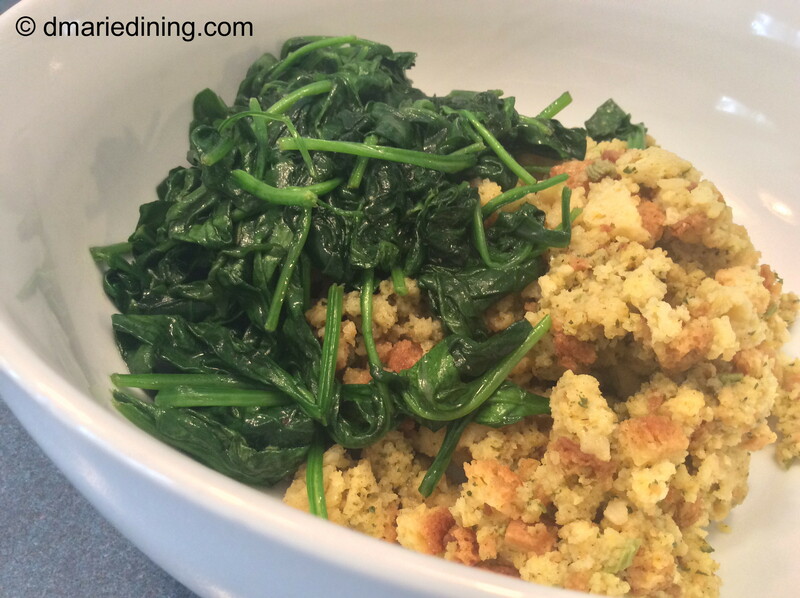 Place cornbread in a bowl and add spinach with juice. Beat egg and add to cornbread and spinach mixture. Mix well then set aside. Season fish with salt and black pepper. Place two fish fillets on a rimmed cookie sheet or in a long casserole dish sprayed with cooking spray. Spoon stuffing onto each fillet. Top with remaining fish fillets then sprinkle with paprika. Place 1 tbsp of butter on each fish fillet. Bake fish for 10 to 15 minutes until fish is cooked through but not dry. 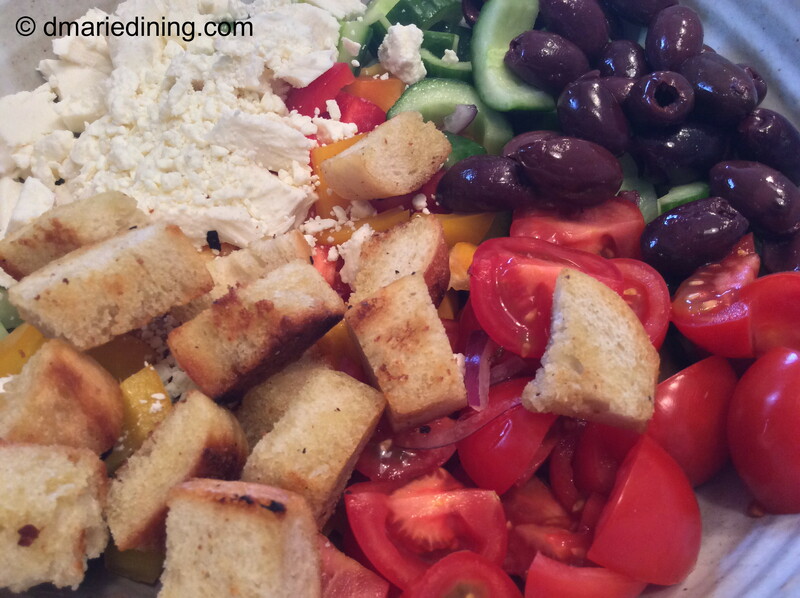 I had never heard of a Panzanella Salad until I saw a cooking challenge on television. The amateur chef was Italian and decided to make a Panzanella Salad because ingredients were limited and time was short. After all, it was a challenge. 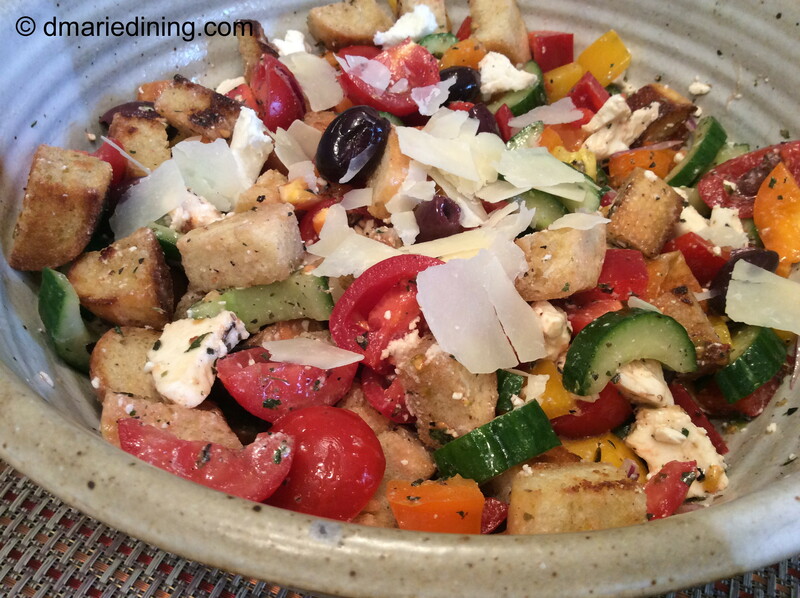 Salads in general don’t take long to pull together and Panzanella Salad fits that bill. 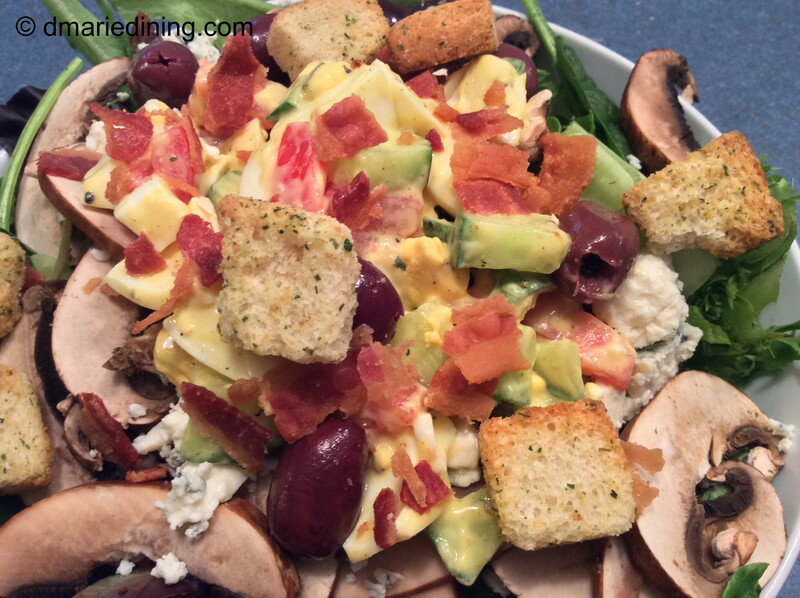 The most time consuming part of making this salad is crisping up the bread cubes. 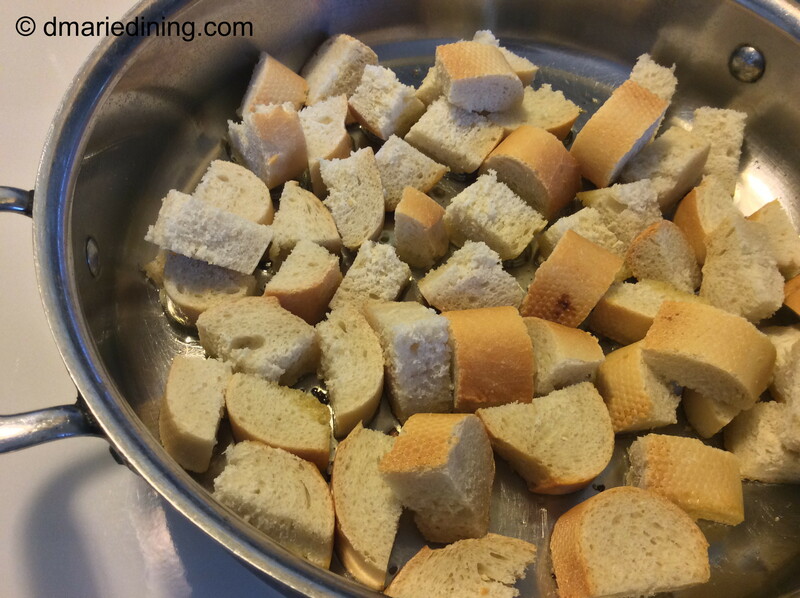 Of course, if you are really short on time you could use prepared toasted bread cubes or even croutons. In a pinch use whatever is quick. 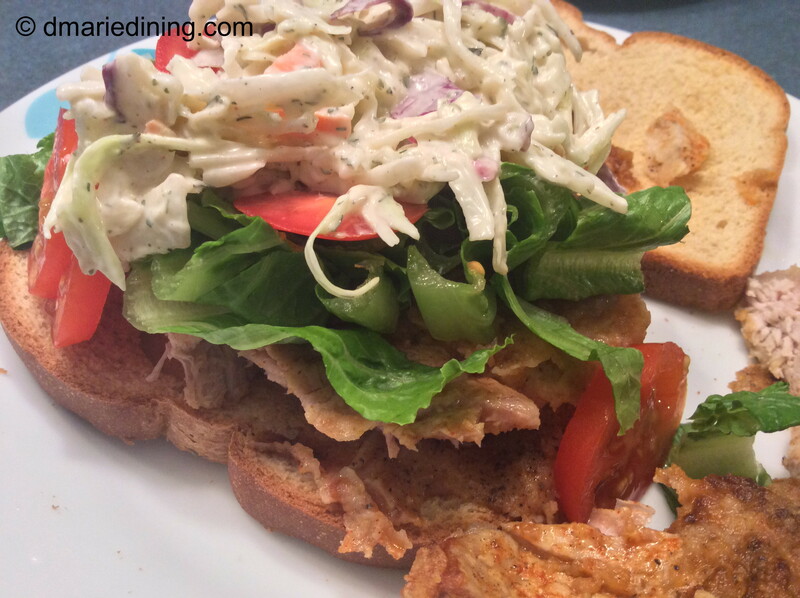 I like crisping up my own bread cubes because I like to use different types of bread when making this salad. 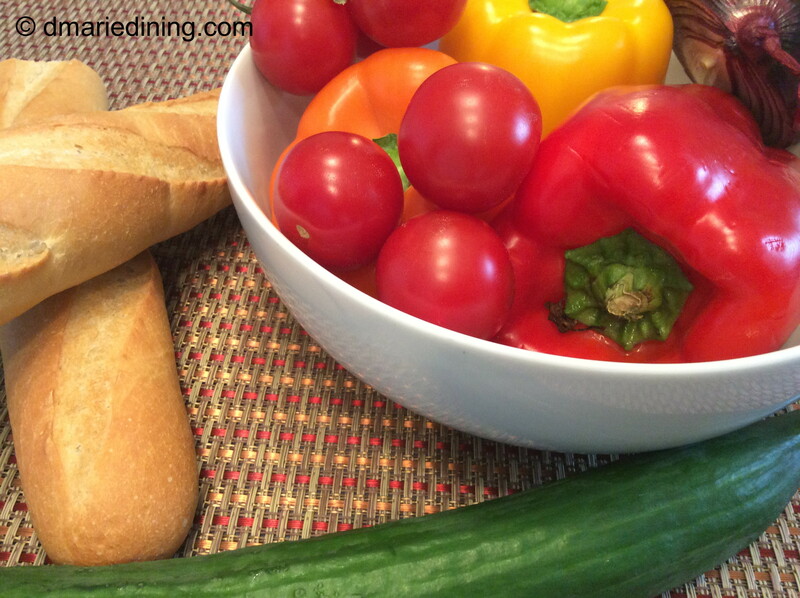 Ciabatta, sour dough bread or even a french baguette are a few of my favorites. One day I want to try and use cornbread but I am afraid it may come out mushy. I will let you know once I figure it out. 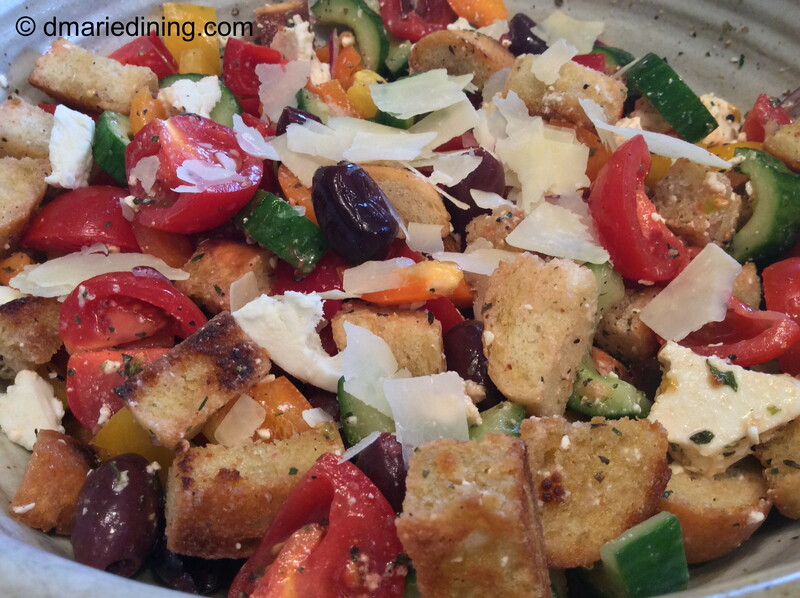 I took a few liberties with my version of Panzanella Salad by adding vegetables not included in the traditional versions (there are many versions of the traditional salad in the universe). The straight forward version does not use peppers or meat. I wanted the salad to be colorful since we often eat with our eyes. My family and I are meat eaters. Plain and simple. We love veggies and can go a few days without eating meat but we always go back to eating fish, fowl, pork and sometimes beef. I offer no apologies to my vegetarian friends. Adding meat is optional. Like I always say …. make this recipe your own. I did! Place ingredients into a small jar and shake to blend. Set aside. Heat olive oil in a large skillet over medium heat. Add bread cubes and allow to crisp up but not toast. Shake and toss the bread cubes to make sure they do not burn. Let cool and set aside. Cut cucumber in half and scoop out the center then cut the cucumber into chunks. Place vegetables in a large bowl. Add prosciutto, feta, mozzarella cheese pieces and bread cubes. Shake dressing then pour over salad and gently toss to combine all the ingredients. 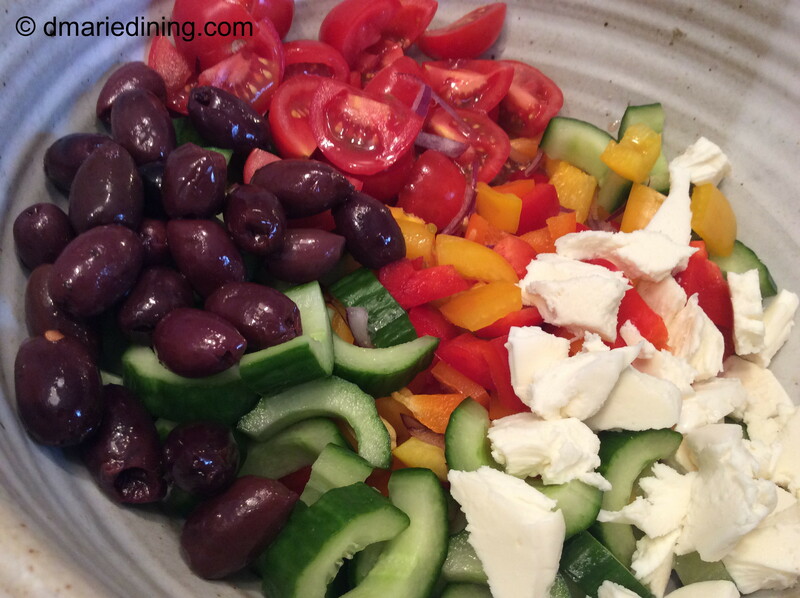 Set salad aside for at least 1 hour and up to 4 hours so that the flavors blend together. Sprinkle with shaved parmesan cheese for garnish. Salmon is probably my favorite fish next to cod. 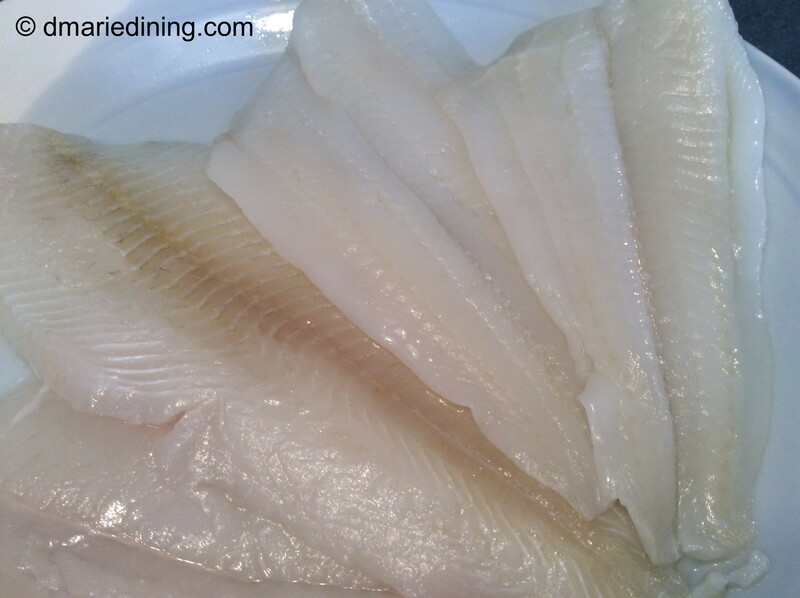 Cod is my go to fish for frying because it is tender and flaky. Salmon tastes great when it is broiled or baked and dripping with butter and lemon. To compliment salmon I like to add a side dish of vegetables and pasta. On some occasions I like to combine everything into a single dish. 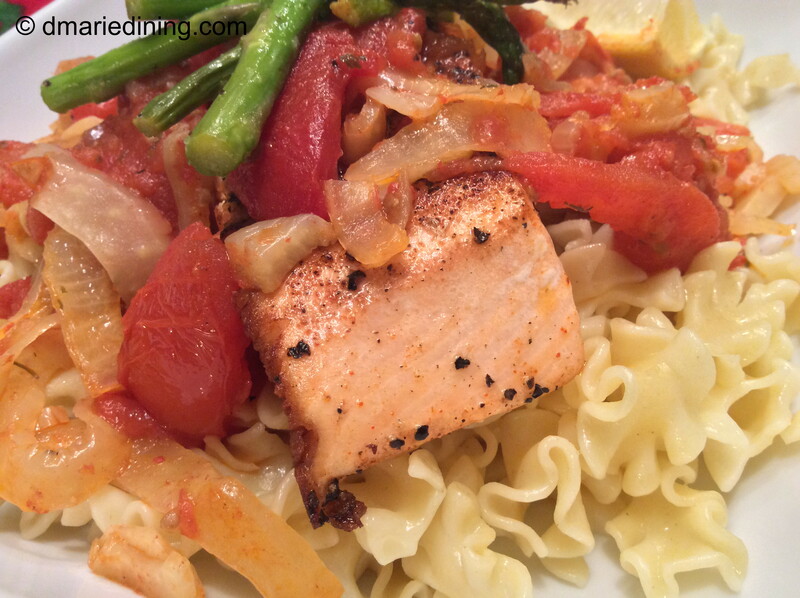 My Salmon with Roasted Tomatoes, Fennel and Pasta is one of those dishes that can be combined into a single dish. Beautiful curls of pasta topped with a tenderly broiled salmon fillet and a cascade of roasted tomatoes and fennel can only make your mouth water when you look at your plate of deliciousness. Okay, Seriously! This is a beautiful dish that tastes wonderful. The type of salmon used in the recipe will change the taste of the dish so use whatever your taste buds like. I am not a fan of sockeye salmon which has a deep reddish orange color and a strong flavor. I prefer Coho or Atlantic salmon which is lighter in color and has a much milder flavor than sockeye. No matter which type of salmon you choose you are sure to get a ton of Omega-3s. Roasting tomatoes brings out the natural sweetness of the tomatoes. Fennel is aromatic and has a sweet licorice flavor. Cooked fennel has a milder flavor than raw fennel so it goes well with the salmon and tomatoes without overpowering the dish. 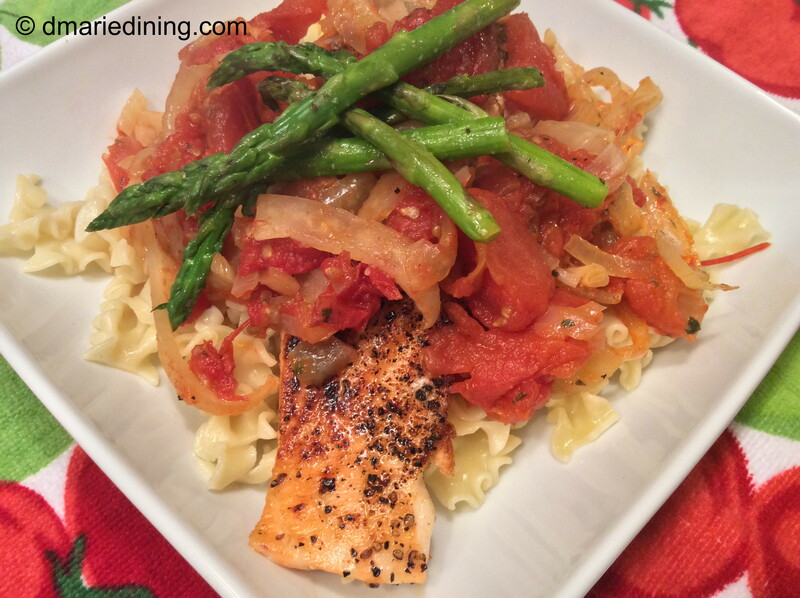 So, if you are looking for a nice healthy flavorful dish to impress your family and friends try out my Salmon with Roasted Tomatoes, Fennel and Pasta. You cannot go wrong with this one. Prepare pasta according to package reserving ¼ cup of the pasta water. Set aside. Place tomatoes, fennel and shallots on a rimmed cookies sheet. Drizzle with olive oil then sprinkle with salt and black pepper. Toss to coat veggies with olive oil and seasonings. 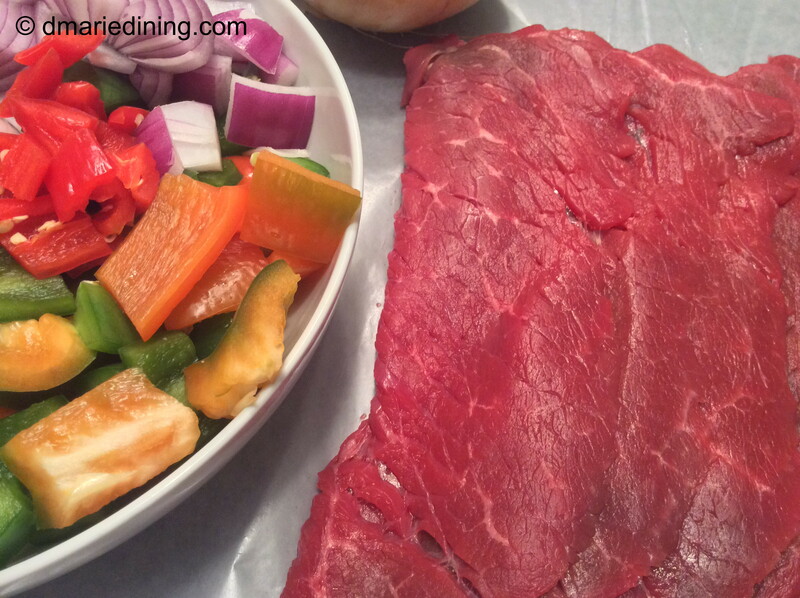 Place in oven and roast for 25 to 30 minutes. 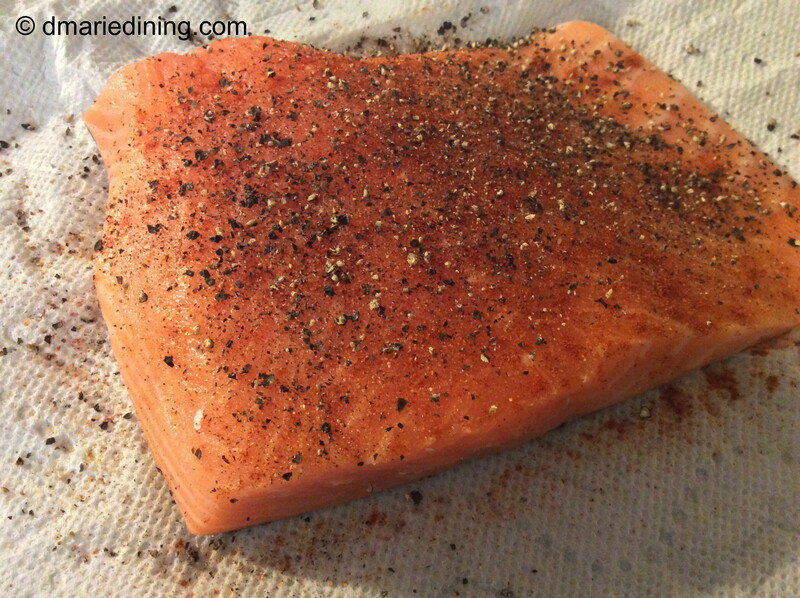 Prepare salmon by placing on a rimmed baking sheet. Season with salt, black pepper and dill. Place 2 tbsp of butter on each fillet. 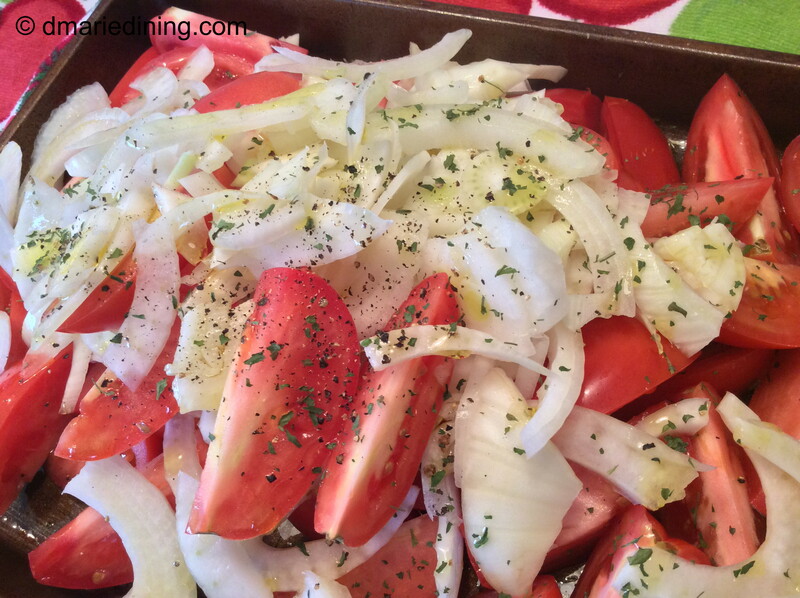 Place in oven with tomatoes and fennel. Cook for 20 minutes. Set aside to rest while tomatoes and fennel finish cooking. 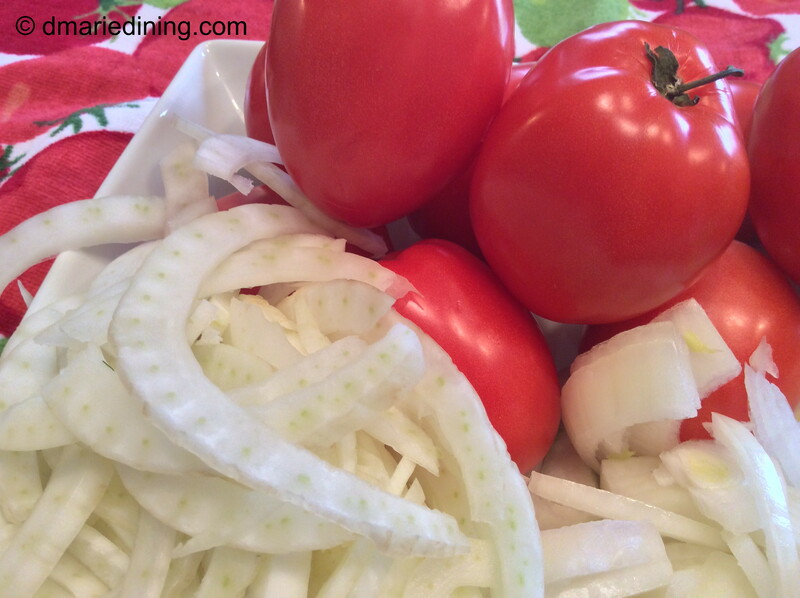 Remove tomatoes and fennel from the oven and pour pasta water over veggies. Spoon pasta onto a plate. Add a salmon fillet then spoon roasted tomatoes and fennel over the salmon. Garnish with shaved parmesan cheese. Today was a non-chicken day since we had just enjoyed a chicken pasta dish and I planned on making chicken again in a couple of days. Only certain folks can eat chicken almost every day but I am not one of them. I do like chicken just not every day. There are times when I think I might grow feathers if I eat one more chicken dish. Because it was a non-chicken day and I had run out of ideas I decided to flip through a food magazine to get help with what I could prepare for dinner. Half-way through the magazine I saw a beautiful picture of a Pepper Steak meal and Bingo I knew what we were having for dinner. 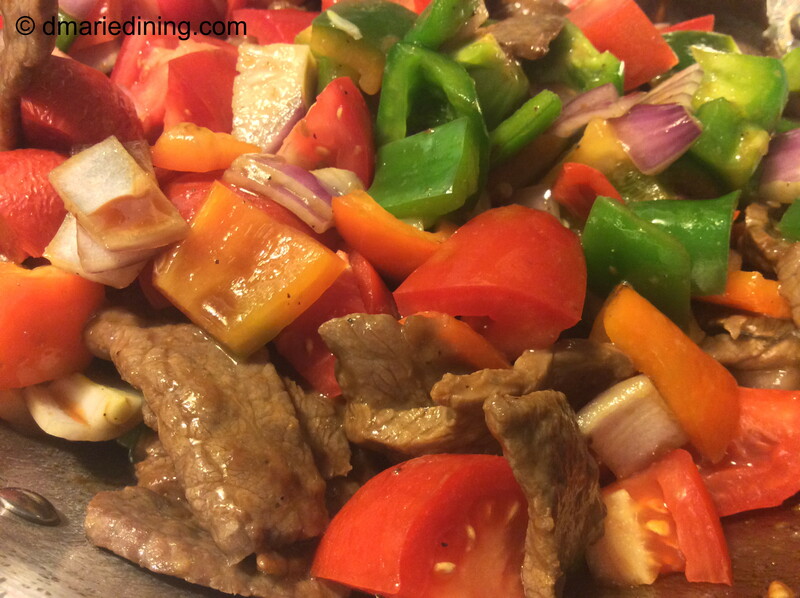 I had a few red and green peppers that were getting soft and I always have onions on hand. I checked the freezer and I had a package of thinly sliced sirloin petite steaks. 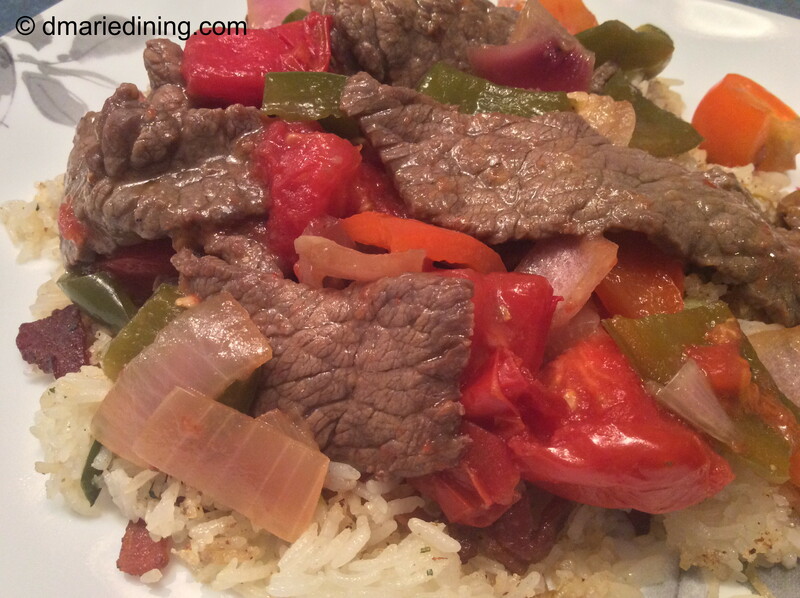 One pepper steak dinner coming up! Granted, I had not made Pepper Steak in many, many years. I couldn’t even find my original recipe so I had to look up a couple of recipes online. I more or less combined a few of the recipes I found and then added my own twist. 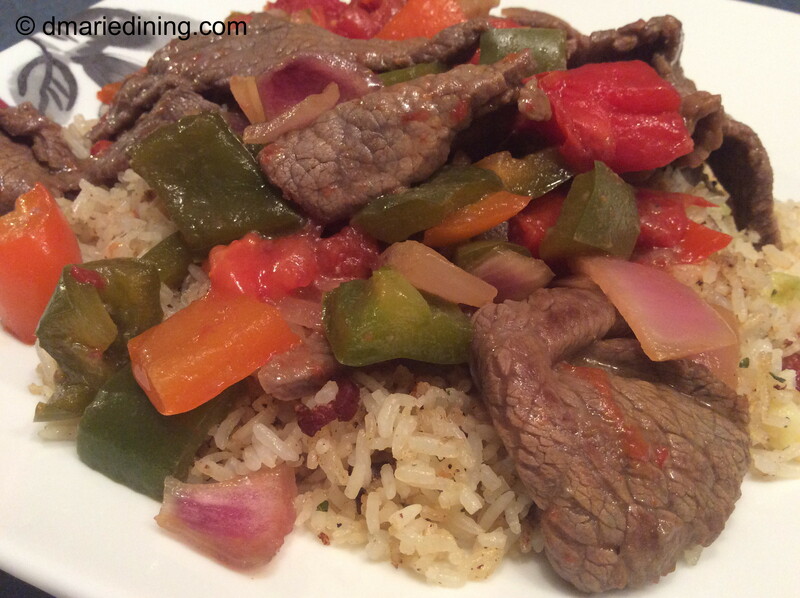 A few tips on how to make a good Pepper Steak. Be sure to buy thinly sliced steak. Trust me. If you use a thicker slice of steak, the meat will be tough and chewy. Marinate the steak to make the meat flavorful and tender. Use ginger in the marinade. The flavor is bold and pairs well with the beef. Pepper Steak may become one of my new favorite dishes besides pork chops. I surprised myself with how good this dish was on the first try. I think the next time I prepare the recipe I will add snow peas or pea pods to jazz it up even more. Then again, why mess with a good thing. 1pkg sirloin petite steak sliced thin. Cut into strips. 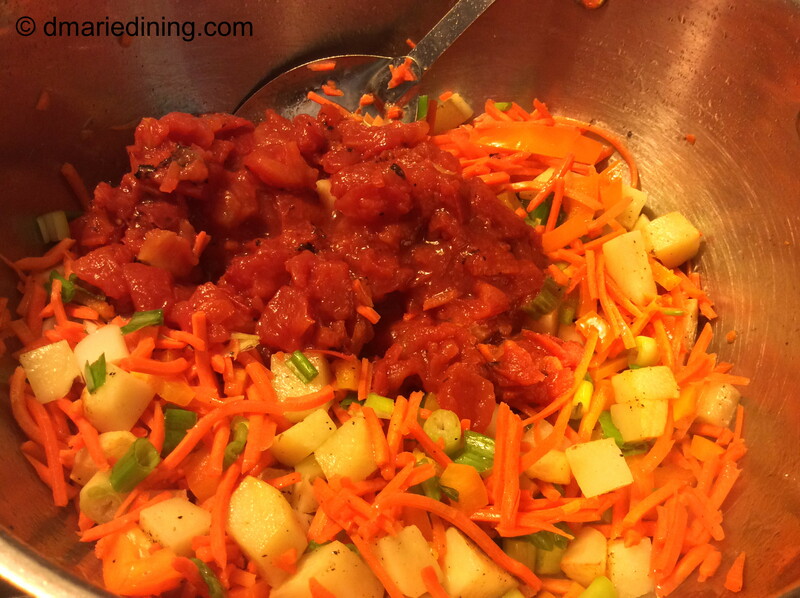 Mix marinade ingredients in a medium sized bowl. 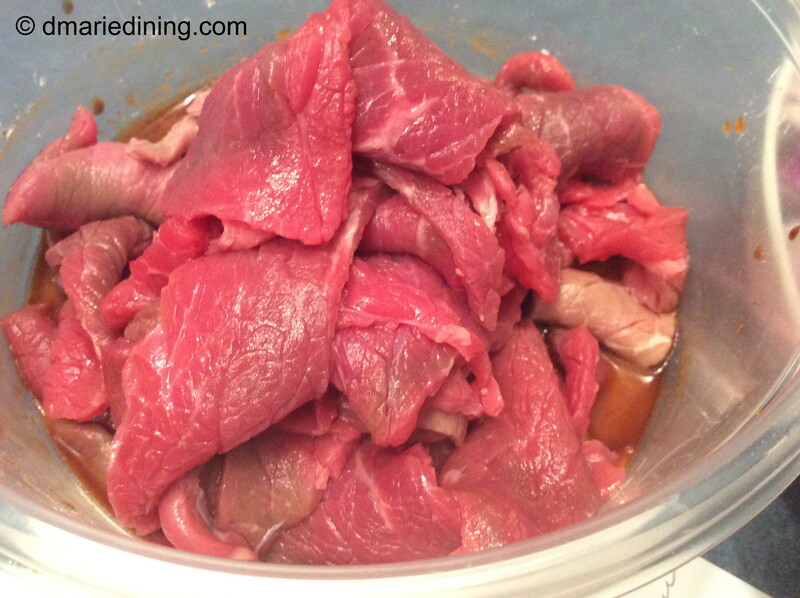 Place steak in marinade and stir to coat meat. Set aside and let stand for 10 – 15 minutes. Reserve any marinade not absorbed by the meat. Heat vegetable oil in a wok or large skillet over medium high heat. Brown meat in batches. Drain on paper towels and set aside. Once all of the meat is browned, pour off all but 1 tbsp of oil (if necessary, add a little oil). Add onions and peppers to the wok along with seasonings. Stir then cook for 1 – 2 minutes. Add tomatoes, steak, beef stock and any remaining marinade. Stir to mix. 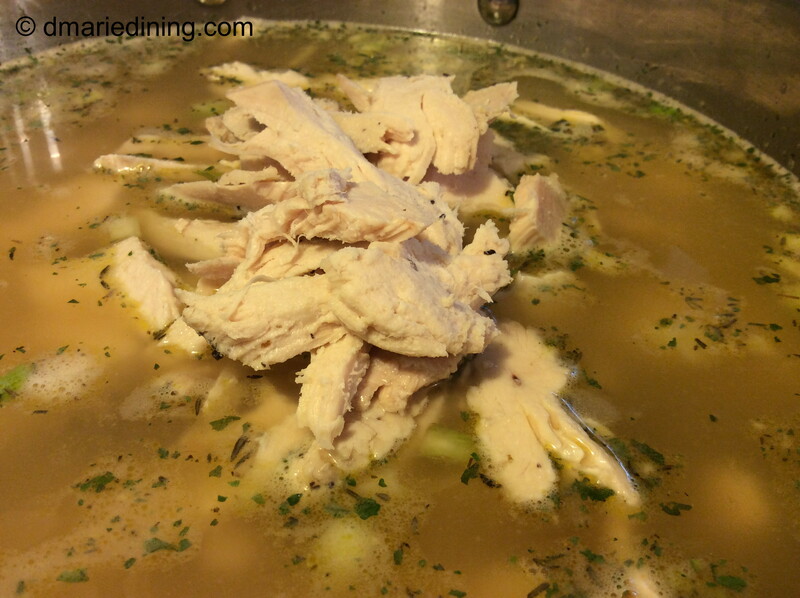 Reduce heat to medium and let simmer for 5 – 10minutes stirring occasionally. Serve over rice. OMGoodness! It is COLD today so what better time to make a big pot of soup. That is exactly what I said to myself on the way to Trader Joe’s to pick up a few items for dinner. I might not have felt so chilled if I had cranked up the heat in the car but that still would not have warmed me on the inside. To make that happen I needed a nice bowl of homemade soup. My choice was either chicken noodle soup or a White Bean Chicken soup. I planned to have spaghetti the next day for dinner so chicken noodle soup was out and White Bean Chicken soup was in. Keep in mind I did not have a recipe for White Bean Chicken soup but not having an actual recipe has never stopped me from cooking. So, while strolling the aisles of Trader Joe’s I made up the recipe that would become “the soup”. Most soups are pretty easy to make. They are a one pot dish that only needs a little tender love and care and lots of seasoning. Because it was freezing outside I was in the mood for a healthy, hearty soup. 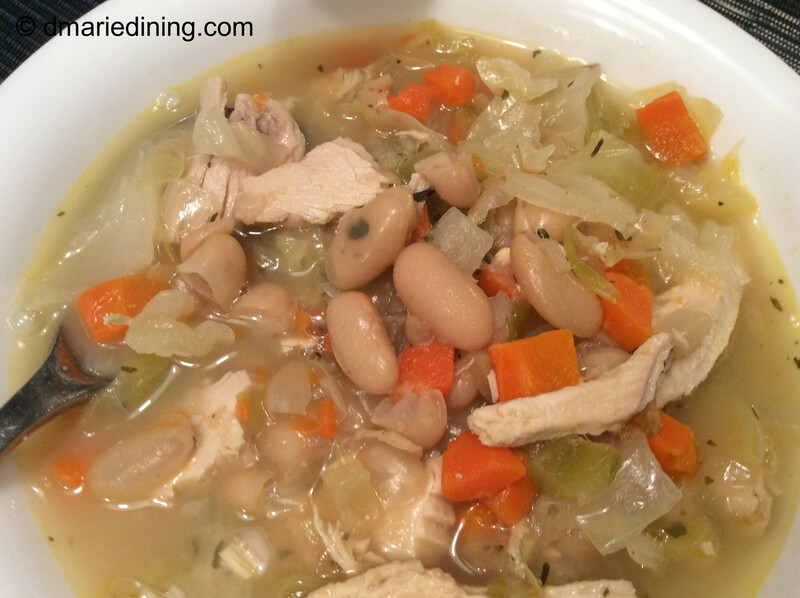 I figured the white beans and chicken would make it hearty plus filling with lots of protein while the mirepoix and cabbage would make it healthy. Did I just hear someone say what the heck is mirepoix? Yes, I did. It was my hubby. He asked me this question while I was writing down the recipe when I got home. I was talking out loud to myself trying to remember how to spell mirepoix and hubby asked “What the heck is that?” When I told him it was diced carrots, onions and celery he said “Why don’t you just say that?” My response was I wanted to sound fancy like the chefs on TV. I know. It is always better to keep it simple. 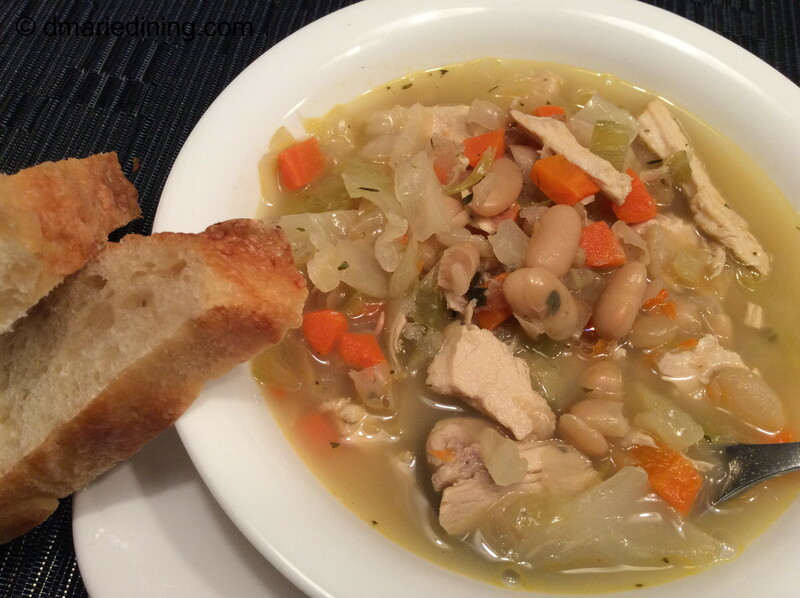 Simply put, White Bean Chicken Soup is comfort food. Whether it is freezing cold outside or you want a flavorful homemade meal in a bowl, this soup will do the trick. Shred chicken and set aside. 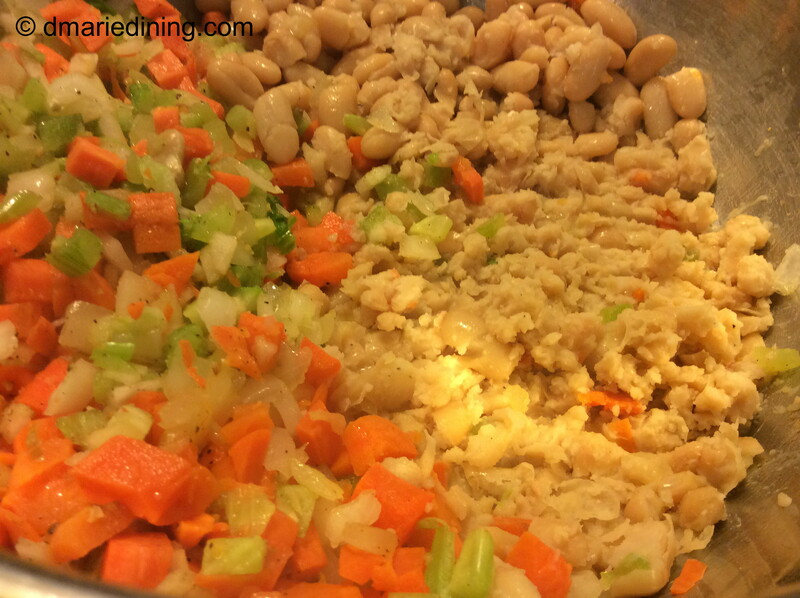 Mash ½ cup of white beans (this will help soup to thicken) and set aside with remaining beans. Heat olive oil in a large pot over medium high heat. Add mirepoix and seasonings to the pot and stir. Allow the vegetables to sweat for 3 – 5 minutes. 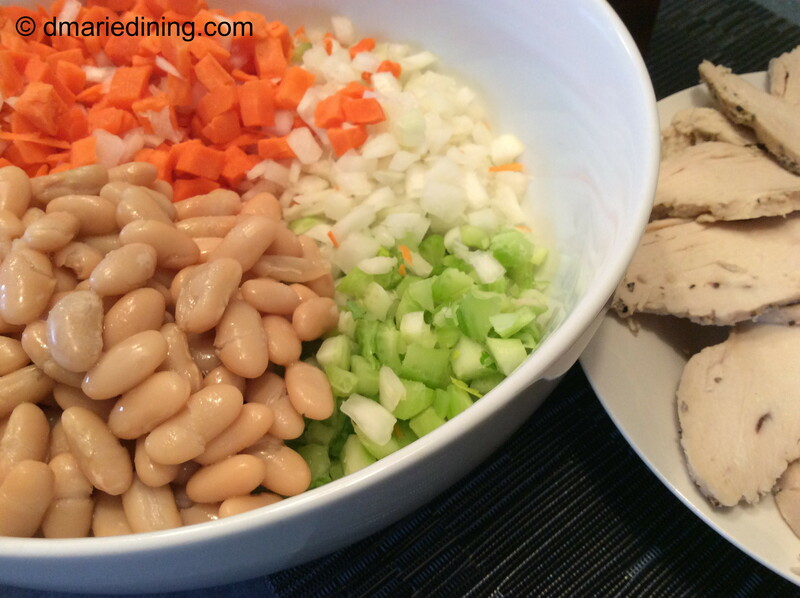 Pour in chicken broth and add white beans then stir. Reduce heat to medium. Mix a spoonful of broth into the measured heavy cream. Add the mixture to the pot. Stir and let simmer 3 minutes. Place chicken in the pot and stir. Cook for 20 minutes then add chopped cabbage. Stir to mix in the cabbage. Simmer for an additional 20 minutes until cabbage is softened and cooked through. Serve with crackers or crusty bread. Y Yes, I am over the age of 30 and I still call my mother “Mommy”. What can I say? I never made the transition from Mommy to mom and I could not see myself calling her mother. Mother seems much too formal to me but I don’t knock anyone that calls their mother – mother. Actually, a couple of my aunts called my maternal grandmother “Mother”. The rest of us called her Ma Dear. However, mother seemed to fit coming from my aunties. Okay, I digressed. Mommy’s Pork Chop Sandwich jumped into my head the other day when I was trying to come up with something for dinner other than chicken or beef. We had already had both during the week along with fish so I had to make a decision on which one would get a second turn for the week. Truth be told I love pork chops. The problem was that my hubby is not big on pork unless it’s bacon. 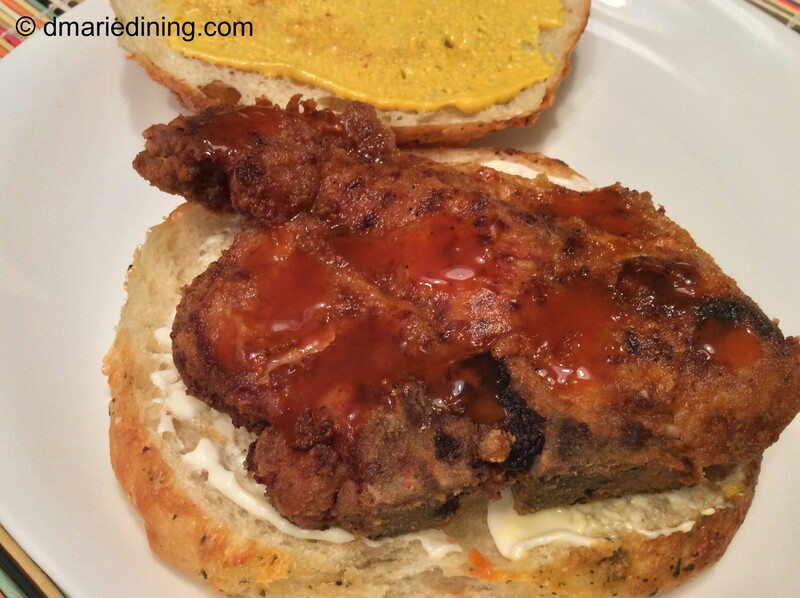 So tentatively, I decided to make pork chop sandwiches like my mom did back in the day. I wasn’t sure he would go for it. To my surprise, when hubby asked what were we having for dinner and I said Mommy’s Pork Chop Sandwich he only said what time do we eat. Now, I am not sure if he was just really hungry or was in the mood for pork. Either way, I was happy. Mommy’s Pork Chop Sandwich is fairly straightforward. Two slices of bread. Mustard. Hot sauce and on occasion a little mayo. This basic combination of flavors tastes wonderful – at least to me. As for my hubby, he jazzed up his pork chop sandwich by adding lettuce, tomato and the cole slaw I made to go with the sandwiches. 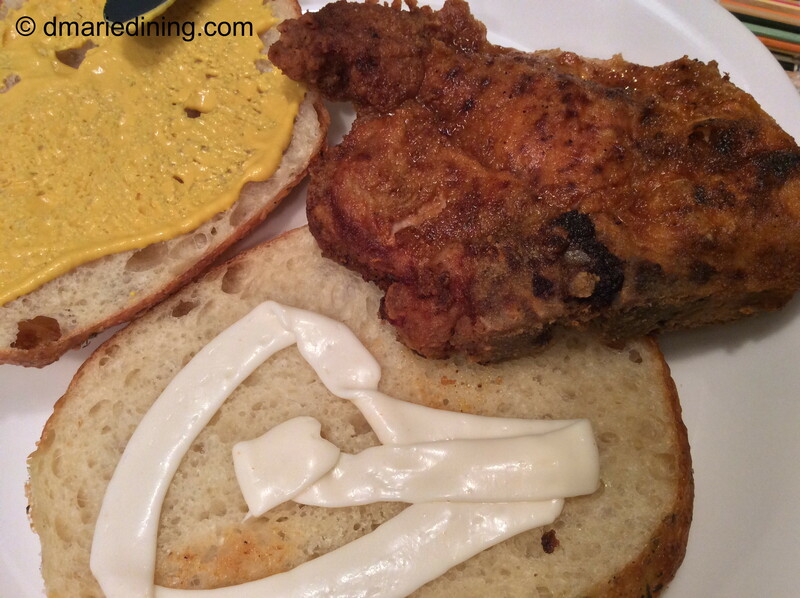 After thinking about my hubby’s creation, I realized the sandwich he made was similar to another sandwich I make which has chicken instead of pork chops. Great minds think alike. Heat oil in a large frying pan over medium high heat. Place flour in a shallow dish and season with a little Adobo seasoning, seasoned salt and pepper. Season pork chops with salt, pepper and Adobe seasoning. Sprinkle with smoked paprika. 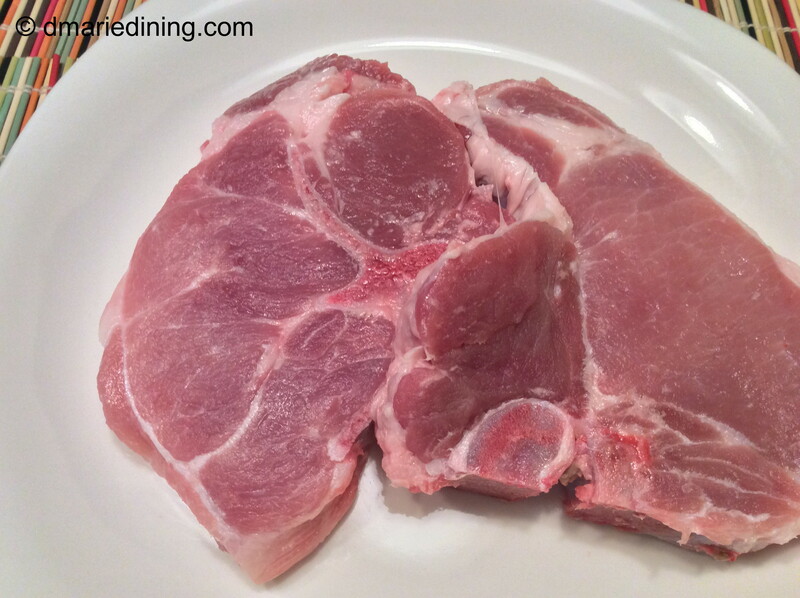 Dredge seasoned pork chops in flour. Shake off excess flour. Gently place chops in hot oil. Fry until golden brown and cooked all the way through. Approximately 5 minutes on each side. Drain on paper towels. Spread mustard on one side of each sliced roll. Place one pork chop on each roll. Shake hot sauce over pork chop (you decide the level of spiciness). 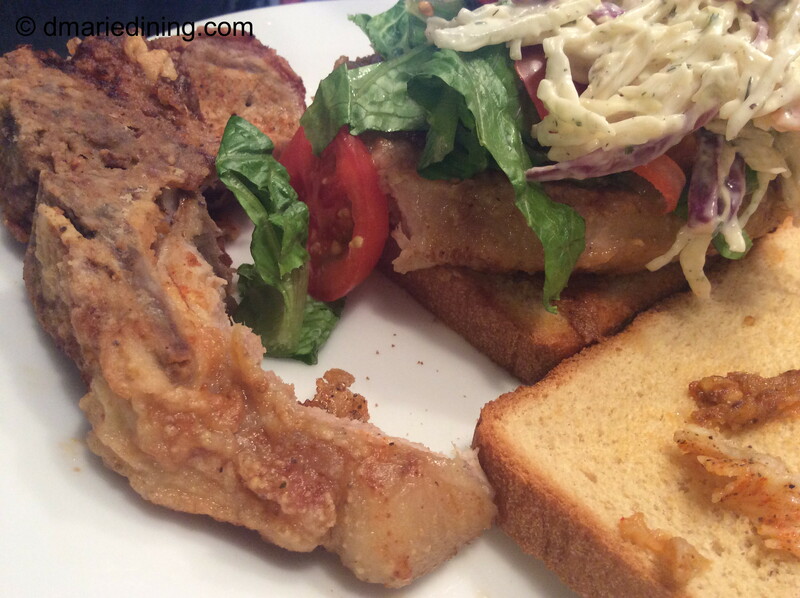 Top pork chop with the other slice of bread. Optional: Add sliced tomato, lettuce and cole slaw. Don’t ask me why but I have had lentils on my mind for the past week. I think it was because I wanted to make some red lentil soup and discovered I didn’t have any lentils. Since I usually find them at Trader Joe’s I had to wait until my weekend ritual of running errands to be on that side of town. Once I got to the store and spotted the red lentils I also spotted green lentils which made me think of a Lentil Stew. Again, I don’t know why. Sometimes my imagination kicks in and I just come up with ideas for combinations of food. For the Lentil Stew I thought of carrots, potatoes and tomatoes as the right combination of vegetables to add to the lentils to make a stew. Yes, a stew not a soup. To me, stews are a little heartier than a soup even more than those soups that are thick and packed with vegetables. Stews have a slightly different consistency than soups and are surrounded by a kind of gravy. In the case of Lentil Stew it makes its own gravy. 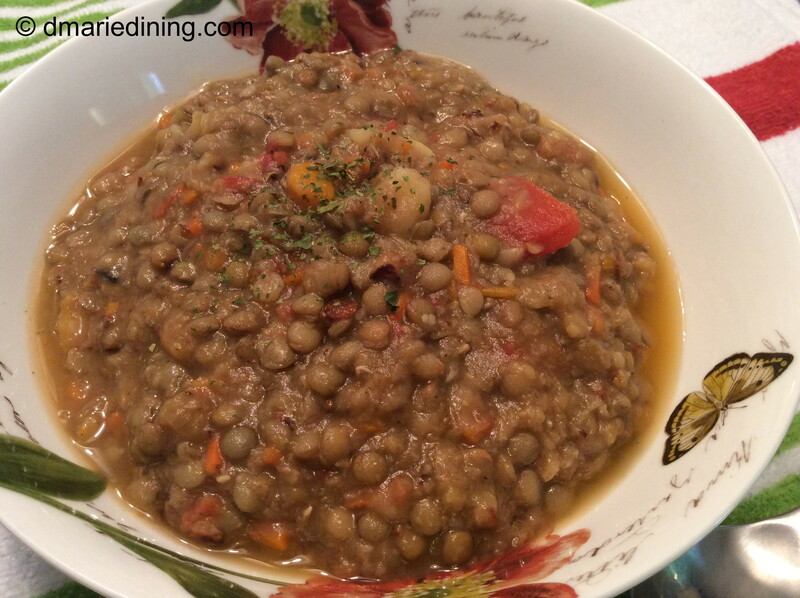 Lentil Stew is the type of dish I would make during the winter or on chilly fall days. Granted, the day I first made this stew it was not really chilly but there was a nice gentle breeze. Now that I have tested out the recipe, I know what I will be preparing it quite often when the gentle breezes turn into strong cold winds. 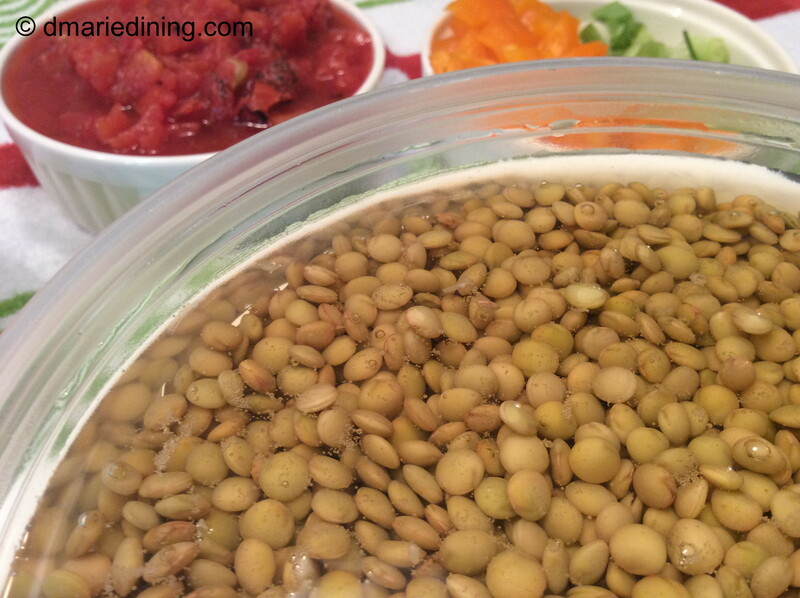 Add lentils and water to a large pot. Bring to a boil then cover and reduce heat to medium low. Let simmer while preparing vegetables. In a large frying pan add olive oil and potatoes over medium high heat. Season potatoes with a little salt and pepper. Saute potatoes until slightly browned. Reduce heat to medium then add onions, carrots, tomatoes and remaining seasonings to the potatoes. Stir and allow veggies to soften. Add veggies and chicken broth to lentils and stir. 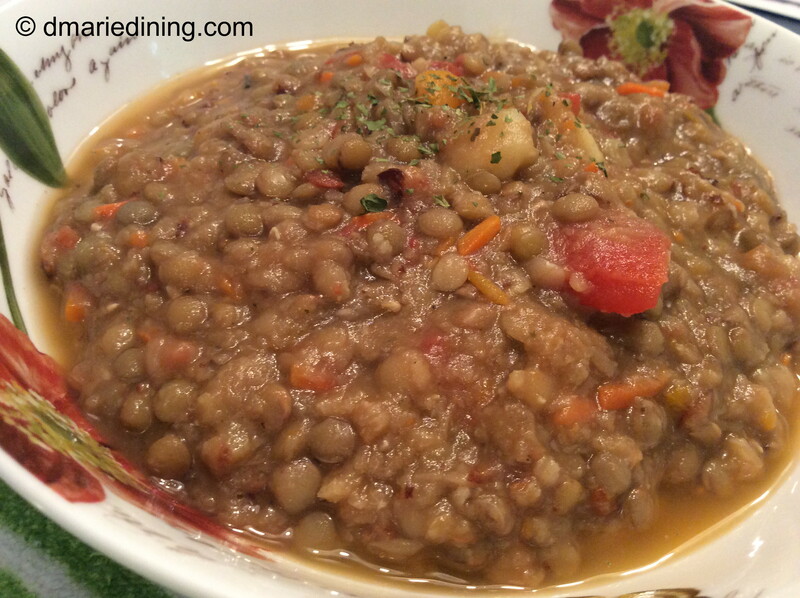 Allow stew to simmer for 20 – 30 minutes until lentils are tender. Taste to determine if you need more salt. Add additional broth if stew is too thick. Unless otherwise noted, all content and photos are © 1981-2019 for Donna Bates and dmariedining.com. All rights reserved. Unauthorized use and/or duplication of this material without express and written permission from this blog’s author and/or owner is strictly prohibited. dmariedining.com recipes by Donna Bates is licensed under a Creative Commons Attribution-NonCommercial-NoDerivatives 4.0 International License. Based on a work at dmariedining.com.